most popular climbing spots in the country! 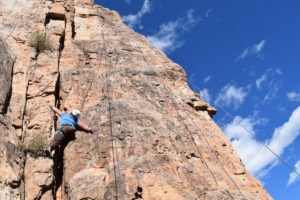 Outdoor climbing trips offer a unique adaptive climbing opportunity for people with disabilities who want to push their vertical limits! 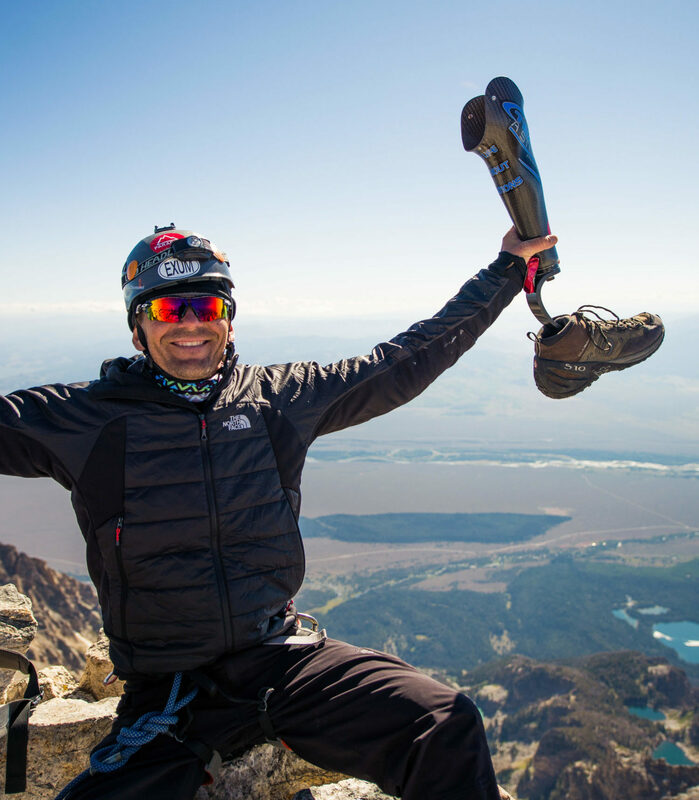 Paradox Sports has over 10 years of experience running outdoor adaptive climbing events with a wide range of abilities, injuries, and challenges. Trips are run by passionate AMGA certified professional climbing guides and experienced Paradox staff who are eager to help you become a competent and confident climber. Paradox focuses on helping you improve technical climbing skills in a safe environment. Each climber has the opportunity to learn from some of the best in the industry! 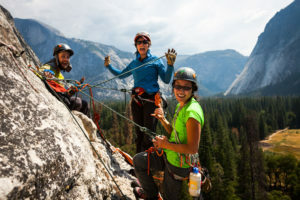 Trips vary in accessibility, length, and location – but all trips offer multiple days of climbing, connecting with other climbers, and improving your climbing ability. Do I need to have a disability to join a Paradox trip? Paradox Sports focuses on adaptive climbing opportunities for people with physical disabilities, including but not limited to people with amputation or limb difference, blindness, hearing impairment, spinal cord injuries, neurological issues, TBI and PTSD. Can my child attend a Paradox Sports trip? Although our main group of individuals on trips is adults, we have had a handful of minors join us on rock and ice climbing trips in the past! As a minor, we require a guardian join them on the trip and register as a volunteer. As a participant am I able to bring a friend, partner, or parent/guardian if I need additional assistance? Yes and we hope you can share these experiences with them! We ask that they register as a volunteer for the trip and help cover the costs of lodging, meals, logistics, guides, etc. and that they are eager and willing to be an active part of the community for the weekend. Are the trip leaders certified climbing instructors? Yes! Our Trip Leaders and guides are AMGA Certified professional guides, often volunteering their time and expertise to help us expand adaptive climbing opportunities. They work for Paradox on a contract basis, taking time away from their full-time positions as guides with other companies. Does Paradox Sports provide gear if the participants do not have any of their own? Yes! We encourage participants to bring their own gear if you have it so you can get familiar with your own equipment, however we do provide gear to climbers who need it. You will be able to list your gear needs during registration. Required gear for any trip: helmet, harness, climbing shoes (or ice boots and crampons for ice climbing). What do I need to pack for the weekend? Depending on what trip you are participating on, the packing list varies. You will be sent a full packing list prior to the event. Please see our suggested packing lists at the bottom of the Trip page. Does Paradox Sports help with transportation to and from the trip? 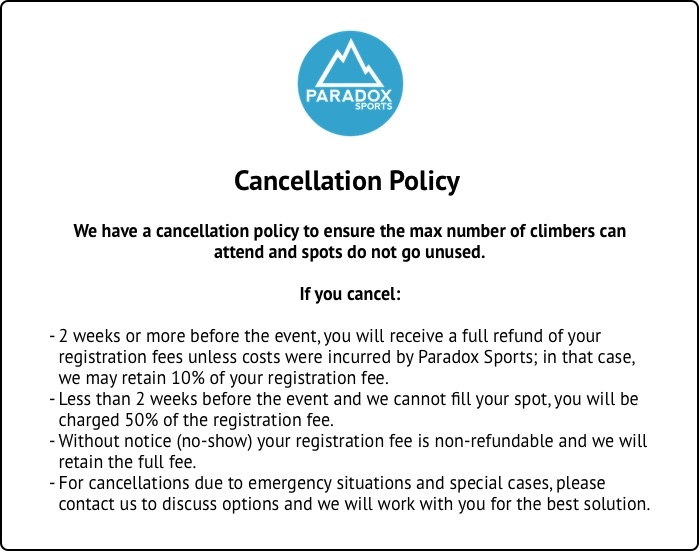 Paradox Sports does not provide transportation directly, however during registration volunteers and participants are asked about their travel plans/needs. We are happy to connect people interested in carpooling that are coming from the same areas! Are the volunteers and trip leaders qualified to handle my disability? With over 10 years of experience working with people with disabilities, the one thing we know for sure is that each disability is unique! You are the expert on you, and our motto has always been that we will work together to communicate and understand your needs. Each trip leader, guide, and volunteer brings their own unique background and expertise as well – from physical therapy and medical backgrounds, to over a decade of adaptive climbing experience. How will I know if this trip is accessible to my disability? 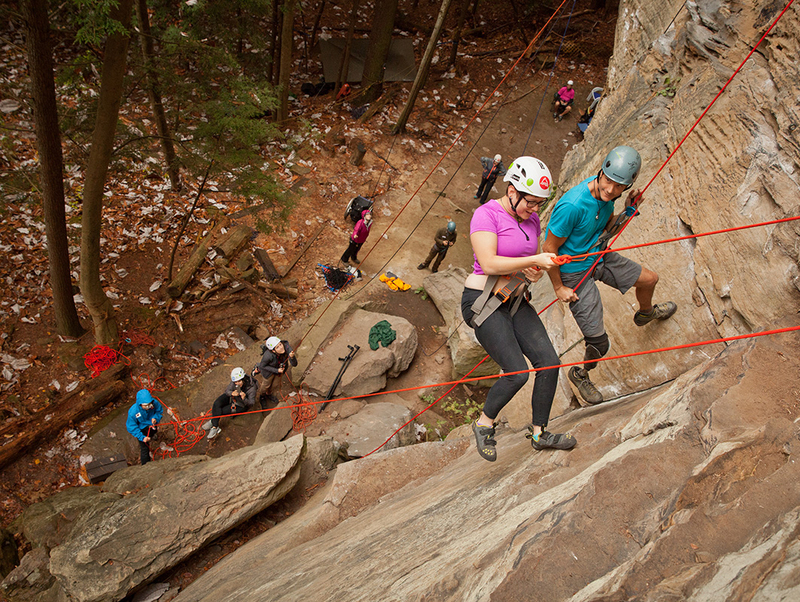 If you are signing up for rock or ice climbing, you likely already have a sense of adventure! Sometimes the path to the crag is not ADA accessible, or the lodging options are limited in these remote areas, but we work as a community to figure it out. After you register for your climbing trip, we will review your application and be in touch to discuss the specific logistics around your trip. Does Paradox Sports seek out climbing areas that are accessible to all participants? Accessibility is a focus for choosing our program areas. However, each program area presents different terrain and unique challenges depending on the adaptive athlete. 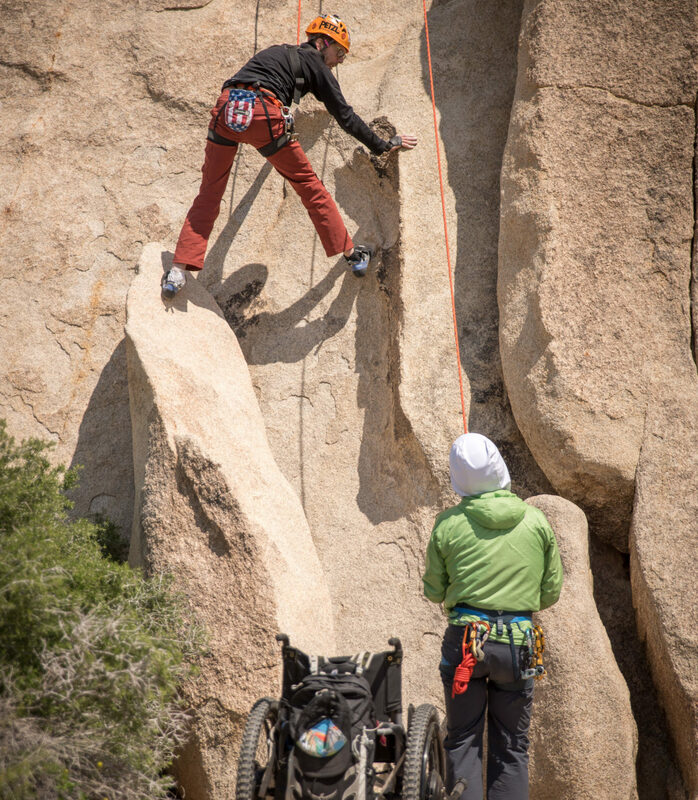 We strive to provide assistance to all our adaptive athletes in all of our program areas, however, we also recognize the spectrum of adaptive athletes and recognize not all our climbing areas may be accessible to all athletes. Are all the trips open to all levels of experience? Will I be bored if I am an experienced climber? On each Paradox trip there is a full spectrum of experience levels. If you are an experienced climber, we can promise you an engaging community, coaching by AMGA certified guides, a diversity of routes and a great overall trip experience. However, we do not provide lead-climbing opportunities on Paradox Sports programs. While on a Paradox trip if I want to learn specific skills, can the volunteers and trip leaders help me work on those climbing skills? It is always our goal to empower our participants! Our certified guides and qualified volunteers are eager to answer questions and help you grow as a climber, within a safe environment. We also offer specific skill building courses for adaptive athletes that want to take their climbing to the next level. We are happy to answer any questions you have and teach some technical skills. We do not provide lead climbing opportunities on Paradox trips (unless backed up on toprope). In case of an emergency are all trip leaders and volunteers able to tackle the emergency successfully (i.e. on the rock or ice, health emergencies, weather emergencies, etc)? Paradox Sports has a thorough Emergency Response System and Emergency Response Team. At the beginning of each program, we will work with the volunteers and climbers to communicate risks and what to do in case of an emergency. The majority of guide, program leads, and Paradox staff also are Wilderness First Responder certified and many volunteers serve on Search and Rescue teams. You are in good hands! I have food allergies and/or restrictions. Can you guarantee that these needs will be met? We try to cover all common needs such as vegetarianism, dairy-free, gluten-free, and allergies. If you are severely allergic to foods, require specific or more frequent snacks, or are worried about cross-contamination, bringing your own snacks is always an option as well. Depending on the trip, some meals are cooked as a group and others are provided by local restaurants. If you have allergies, please list them in your registration and we will work with you to meet your needs. I have medications that need to be refrigerated while on the trip, can Paradox accommodate this? Yes we can definitely take care of that for you! I have to take medication daily. What is Paradox’s policy with regards to medication? Participants on our trips have historically administered their own medications. Paradox Sports staff is not QMAP certified and will not administer medication to participants. If someone is a minor or requires medical assistance, they have often had someone qualified join them on the trip. If I want to attend a Paradox trip, but cannot afford to pay the fee, does Paradox help with some of the fees? As a nonprofit organization, Paradox already offers trips below cost thanks to generous donations, however we also offer scholarships based on financial need and availability of funding. If you are in need of financial assistance you can submit a scholarship application through the website (more information at the bottom of the page). What if I need to cancel - am I able to get my registration fee refunded? We understand that injuries happen, work gets in the way, or other issues arise that mean you cannot join the trip. You can see the full cancellation policy at the bottom of the page. Have other questions? We are happy to help! Please email us at info@paradoxsports.org or call the office 720-638-5593. Being properly dressed is essential to enjoying your outdoor adventures. Layering will give you more versatility, depending on the weather and your activity level. Wool or Synthetic Shirts: No cotton! Cotton keeps you cold if you sweat and it takes a long time to dry out, while wicking fabrics help you regulate your core temperature and avoid overheating or chilling. Pants: Synthetic abrasion resistant pants are best for climbing. Lightweight and stretchy to allow you to move are the rock are ideal! Waterproof and Breathable Shell: Rain jacket with a hood should always be in your pack just in case. Insulating Jacket: A heavy fleece, down or synthetic puffy jacket to keep you warm in the shade at the crag or at night – especially for camping trips. Footwear: Climbing shoes if you have them, hiking shoes for the approach, flip flops for at the crag. If you do not have your own, you can request to borrow any necessary gear during registration. Personal Hydration System: water bottles or bladder with a hose in your backpack. Recommended to have at least 2 (1) Liter bottles. Backpack: large enough to hold all your gear without strapping extra gear to the side. It’s nice to have a pack that has a hip belt to help support the weight. Recommended size is 25-35L pack. Any adaptive equipment or systems you use for climbing. For example, Evolv Climbing shoe and TRS foot! Snacks and Food: Typically, meals are provided, and we will have some snacks and bars available. However, you may want to consider bringing some snacks of your own, especially if you have dietary constraints. As any mountaineer will tell you, finding the right layers and gear is an ongoing and developing process, especially with new technology and personal preferences. Each person’s needs are unique, and many factors add to decisions about what you should wear (weather being a primary consideration!). If you do not have some of these items, you can indicate so on your registration, and we’ve got you covered! We expect that you will be dressed and ready to go for the meeting time to head to the climbs on the first day – so let us know of any questions during the welcome night (or prior to the trip!). Clothing is as important as your boots and ice axe. Being properly dressed is essential to enjoying your outdoor adventures. One key rule: try to use synthetic fabrics or wool for all layers. No cotton! Cotton keeps you cold if you sweat and it takes a long time to dry out, while wicking fabrics help you regulate your core temperature and avoid overheating or chilling. Layering will give you more versatility, depending on the weather and your activity level. Base Layer: Top and Bottom. Light to mid-weight synthetics, snug fit and close to skin. Socks: Wool or wool blend socks are great natural insulators, even when wet. Make sure you fit footwear with heavier socks for more warmth. Footwear that constricts your foot will constrict your blood flow and cause your feet to be cold. Mid Layer: add mild insulation to help retain heat that your body creates, and are worn between the base layer and insulation if needed. Power-Stretch and micro-fleece such as Polartec are ideal materials for this layer. Insulating Layer: Examples of insulating jackets includes a thin down sweater or vest, synthetic jacket, heavy fleece, or softshell. Waterproof and Breathable Shell: Outerwear (jacket and pants) that is waterproof with increased breathability will be more adaptable and can help transfer moisture away from your body to keep you dry and protected from the elements. Jacket MUST have an integrated hood. Flimsy “stow-away” nylon hoods are not adequate. Full side zip pants are helpful. Down or Primaloft Jacket: This layer is put on when you stop for a break. A big, warm, “puffy” jacket (hood recommended) worn over all layers to keep you warm between climbs. Gloves or Mittens: Pack at least two pairs. One pair of thinner gloves is used for climbing when your hands are not cold and need to be dexterous. One pair of mittens or warm ski gloves are worn when your hands are cold and don’t need to be dexterous. It’s hard to have too many extra gloves when ice climbing! We will also have hand warmers available. Warm Hat: This hat should cover your ears and can be made of fleece or wool, without a pom pom or bulk. Remember to fit the hat so you can wear it under a helmet. Balaclava or “Buff”: When the temperatures drop and the wind picks up, the skin on your face becomes very vulnerable to frost nip, and even worse, frostbite. Wearing a thin layer over your neck, chin and cheeks adds protection and warmth to your clothing system. Personal Hydration System: Wide-mouth water bottles are recommended for winter. Please avoid hydration systems (hoses) or disposable bottles, as they tend to freeze easily. Eyewear: Protect your eyes from the sun and flying ice. Backpack: large enough to hold all your gear without strapping extra gear to the side. It’s nice to have a pack that carries ice axes easily and that has a hip belt to help support the weight. Gaiters: Gaiters cover the top of the boot to keep out rain, snow, and ice, and make you less likely to trip on loose pant legs and damage them while walking and climbing in your crampons. Harness: Any rock climbing harness works for ice climbing. Any adaptive equipment or systems you use for climbing. For example, crampon feet! We will also have some prosthetics available for you to use. Ice Climbing Boots: Warm and either plastic, synthetic or leather, with toe and heel bales for crampon attachment. Paradox Sports will provide these if you indicate on your registration that you needed them. Crampons: Front point style, step-in crampons, ideal for technical ice climbing. Ice Tools: If you have them, bring them! If you don’t, don’t worry! We will provide them. Snacks and Food: All meals are provided, and we will have some snacks and bars available. However, you may want to consider bringing some snacks of your own, especially if you have dietary constraints. As a nonprofit organization, our generous donors subsidize all of our programs. We strive to make our programs financially accessible for all, while maintaining financial sustainability of Paradox Sports. Each Paradox program registration fee is priced well below the actual cost of providing these top-notch experiences. We recognize that for some individuals, even these subsidized fees may present a financial challenge, and we are ready to work with those people to help make Paradox programming a possibility. You may fill out an application for additional financial assistance by completing the form below. The funds we have available for additional financial assistance varies over time and is not guaranteed. Financial assistance is assigned based on financial need only. Please note that Paradox programs are offered below the actual cost of providing these experiences. Our generous donors have subsidized the registration fees for each program. Funds for additional financial assistance are limited and are disbursed based on financial need only. 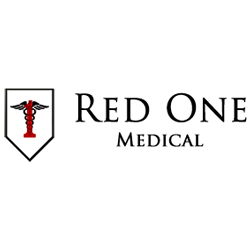 In partnership with Red One Medical Devices, Paradox Sports has launched the Paradox Veterans Scholarship Fund. 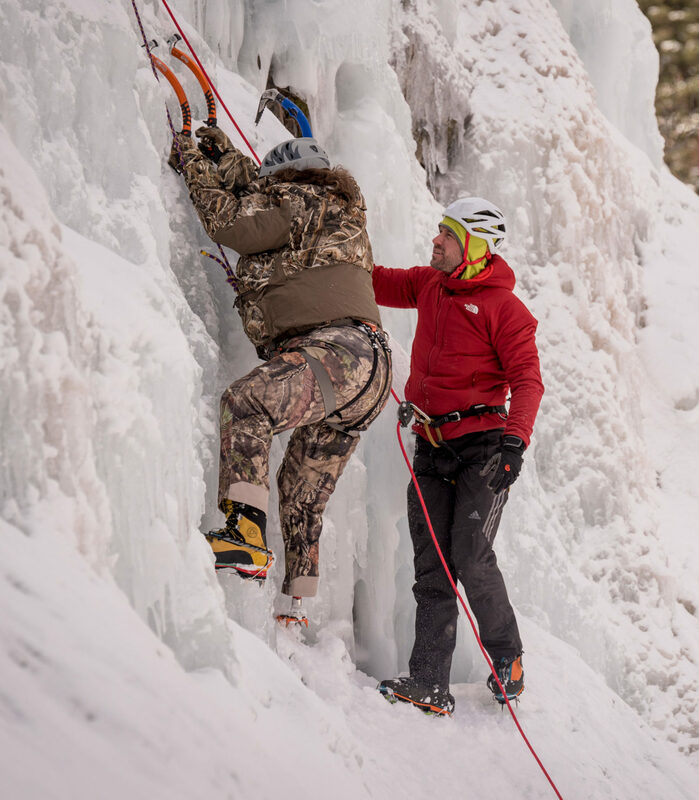 This fund gives military veterans who have been injured defending our country the opportunity to get over some physical or mental hurdles that they have experienced through participating in Paradox’s rock climbing, ice climbing and mountaineering programs. Since 2007, Paradox Sports has been a place to connect, push limits, and change beliefs about what’s possible with a disability. Each year, we impact over 450 people of all (dis)abilities including spinal cord injuries, amputations/limb difference, visual impairment, traumatic brain injuries, neurological conditions, PTSD and more. With this scholarship, Paradox is able to serve more veterans and allows veterans to apply for funds based on financial need. We recognize the incredible sacrifice that our Military Veterans have given this country, and our goal for this scholarship is to give back to them, in a way that is adventurous, empowering and impactful. If you are interested in supporting this fund please contact Paradox Executive Director Mike Neustedter, mike@paradoxsports.org.